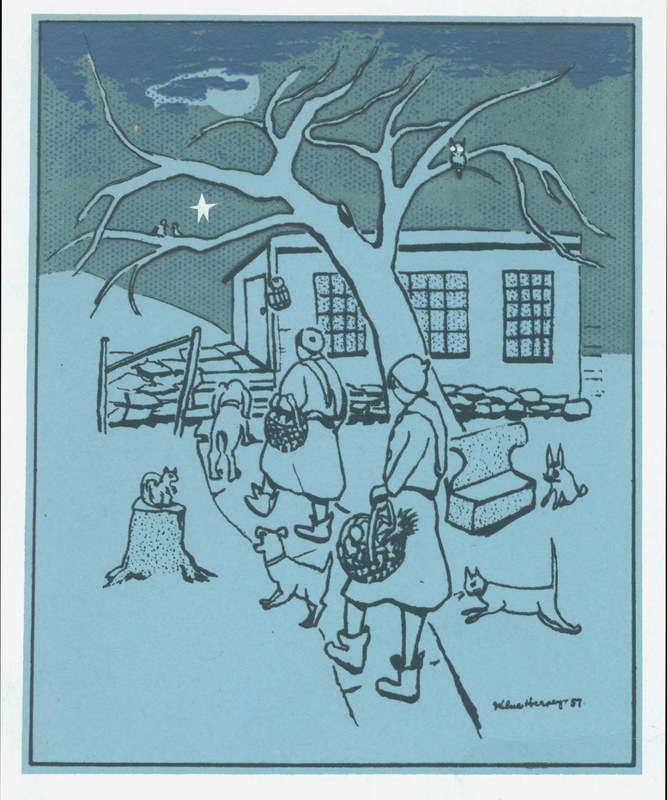 The Historical Society of Woodstock unveils its annual holiday exhibit and sale this Friday evening, December 6th, from 4:00 to 8:00 pm. 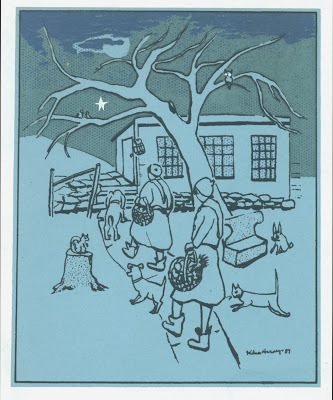 Along with vintage photographs from Woodstock's snowy past, this year's exhibit, Winter in Woodstock, presents paintings from the HSW art collection and an all new display of original holiday cards created by Woodstock's most noted artists, This year's celebration of the holidays also features the launch of a new cookbook compiled by HSW, titled, Woodstock Party Fare. 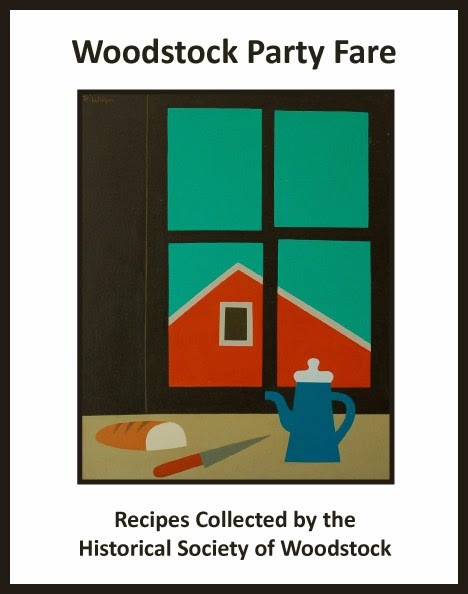 Offering recipes for any festive occasion, Woodstock Party Fare is a collection of hometown recipes and personal remembrances gathered from Woodstockers and Woodstock families. 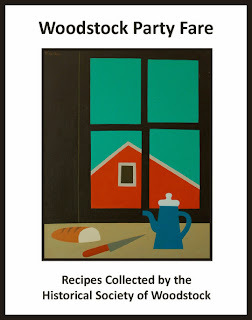 Samples of selected recipes will be featured during the Friday evening opening. Also available for sale will be tins of the best in homemade cookies, handmade ornaments, knitted mittens, local history books and DVDs, candles, vintage postcards and much more. 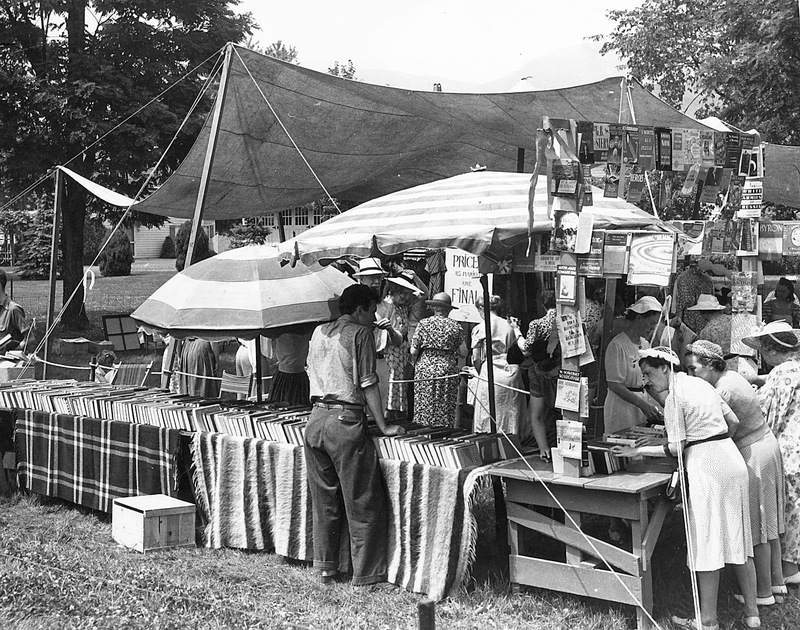 The exhibit and sale continues on Saturday and Sunday, December 7, 8, 14 and 15 from 12:00-4:00 pm. On Saturday, December 14th at 2:00 pm, Janine Fallon-Mower and Richard Heppner, authors of Legendary Locals of Woodstock, will discuss their new book and offer thoughts on local history. Refreshments will be served. The Historical Society of Woodstock is located on lower Comeau Drive in Woodstock. Parking is available in the lower Comeau parking lot. As always, admission is free. 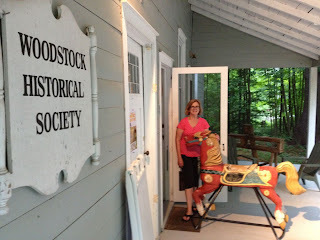 For more on Woodstock history visit Historical Woodstock on Facebook. Your support of local history is appreciated. Please join us for a screening and discussion of a documentary film with the filmmaker Bruce Kennedy. On November 2 at 4:00 p.m., The Historical Society of Woodstock will host filmmaker Bruce Kennedy for a viewing of his work-in-progress film "Righteous Rebellion," an examination of the Anti-Rent War that once gripped upstate New York, including Woodstock. During the 19th century, 300,000 farmers remained controlled by wealthy landowners and an archaic, 200-yer old, semi-feudal form of land and social authority. 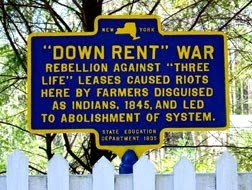 As a result, without hope of ever securing the right of ownership to the lands they worked and developed, local farmers took up the cause of resistance against the 1% of their day. 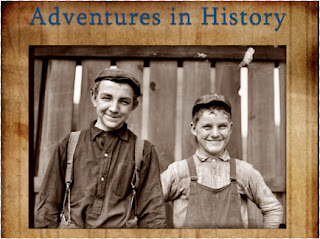 To tell this unique story, Mr. Kennedy has enlisted the thoughts and commentary of 30 local historians and descendants of those who participated in the rebellion, ensuring that this piece of largely forgotten history remains truly local. As a descendant of Dr. Smith Azer Boughton, aka Big Thunder, a principal leader of the rebellion, Mr. Kennedy will also share his family's stories and reveal new and never before offered interpretations and insights into the Anti-Rent War. 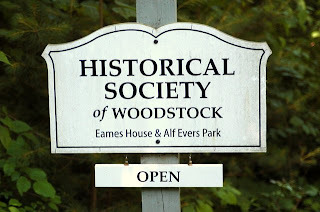 The Historical Society of Woodstock is located on Comeau Drive, just off Tinker Street and directly across from the Woodstock Town Hall. Admission to this event is free and refreshments will be served. Glenn Kreisberg: Lithic Alignments in the Northeast: Natural, Native or Nonsense? On Saturday August 31, the Historical Society of Woodstock will welcome Glenn Kreisberg for a talk titled, Lithic Alignments in the Northeast: Natural, Native or Nonsense? The talk will begin at 3:00 p.m. and is open to the public free of charge. Kreisberg is a writer and researcher who currently serves as Vice President of the New England Antiquities Research Association. He has researched and published articles and interviews on electromagnetism and the ancients, historic bluestone quarrying in upstate New York and lithic sites and alignments in the northeast U.S., among others. Kreisberg is also the founder and editor of the alternative science and history web site www.ASHnews.org. 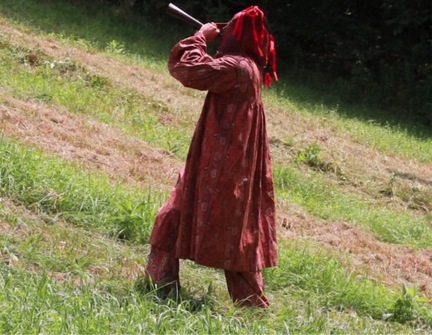 He has edited and contributed to the anthologies “Lost Knowledge of the Ancients” and “Mysteries of the Ancient Past”, published in 2010 and 2012 by Inner Traditions - Bear & Co.
During the course of his presentation, Kreisberg will address such questions as: was observational astronomy practiced by ancient native populations in northeast America and has our area been totally and inappropriately marginalized by the mainstream when it comes to archaeoastronomy and landscape archaeology? The talk will also demonstrate that the Northeast and our region is right up there with the Southwest, Midwest, Effigy Mounds, Lower Mississippi Valley, and other traditions in terms of archaeoastronomical alignments, sensitivity to landscape features, and cosmological understandings. In 1913, ten years after his vision for an art colony found reality in Woodstock, Ralph Whitehead turned that same vision towards the future of Woodstock as a community. 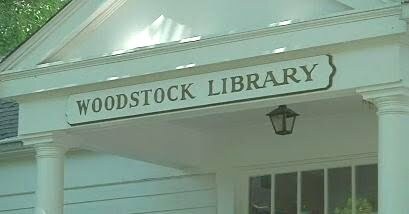 As related by Frances Rogers in her wonderful history of the Woodstock Library, "The Story of a Small Town Library", "Whitehead now began to think about and plan a civic program of a very different nature." A project, as Rogers quotes Whitehead, that "the villagers and the rest of us, the outsiders, could share." 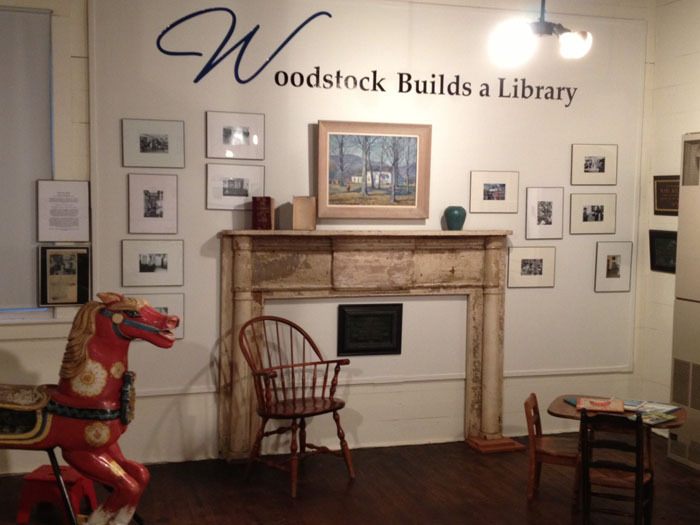 That future, now an integral part of Woodstock history, will be celebrated beginning this Friday evening, June 28, as the Historical Society of Woodstock in collaboration with the Woodstock Library unveils its summer exhibit, "Woodstock Builds a Library: Past, Present and Future – 1913-2013" with an opening night reception. Featuring reflections on a century of service by the Woodstock Library, the exhibit offers a unique look back at the librarians who served, the expansion of the library, chidren’s programming (even Peter the carousel horse by Maud and Miska Petersham, pictured above, will make an appearence) and Woodstock’s venerable rite of summer, the Library Fair. 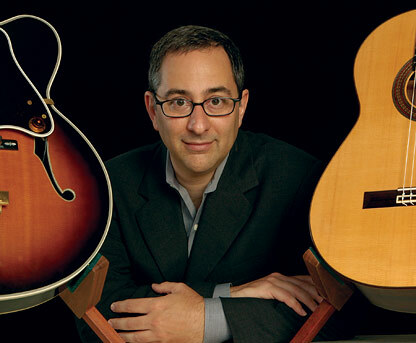 The Friday evening reception will feature the music of jazz guitarist and vocalist Perry Beekman and runs from 7:00 pm till 9:00 pm at the Historical Society of Woodstock on lower Comeau Drive. Visitors are urged to park in the lower Comeau parking lot and walk the newly rennovated trail (thanks to the Comeau Trails Committee) to the Historical Society. In addition to the Friday evening opening, the exhibit will be open to the public throughout the summer on Saturdays and Sundays from 1:00 to 5:00 pm. As always, all events are free of charge. Perry Beekman, is a guitarist and vocalist deeply rooted in the classic tradition of jazz. Perry's swinging, melodic guitar playing beautifully complements his easy-going vocals. Now based in Woodstock, New York, Perry has been playing in jazz clubs, and at private and corporate events throughout New York City for the past 25 years. He has performed at such prominent venues as the Palm Court at the Plaza Hotel, The JVC Jazz Festival, and the Maverick Concert Hall. Deborah Heppner, President of HSW, welcomes "Peter, the carousel horse", on loan from the Woodstock Library. 19th centuries by settlers unafraid of hard work and sacrifice striving to carve a community and a living from the challenges of a rugged countryside. The same call was heard in the 20th century by artists, musicians, and free-thinking individuals who, drawing inspiration from Woodstock's natural landscape, fashioned a cultural climate unique in the history of small-town America. 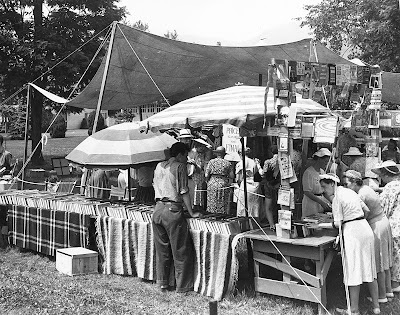 From political leaders such as Elias Hasbrouck, Albert Cashdollar, and Val Cadden to cultural visionaries such as Ralph Whitehead, Hervey White, and Albert Grossman to men and women like Mescal Hornbeck, John Pike, Dr. Norman Burg, and Sam Mercer, who worked to sustain Woodstock's spirit of community, Legendary Locals of Woodstock offers a unique reflection on the road Woodstock has traveled. 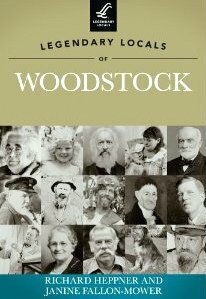 Woodstock town historian Richard Heppner and local historian Janine Fallon-Mower have drawn upon Woodstock's distinct history to offer a look at those individuals who have engraved their names in the foundation of Woodstock's ever-evolving story. Fallon-Mower is the author of Woodstock and Woodstock Revisited. Heppner is the author of Remembering Woodstock and Women of the Catskills. Proceeds from book sales will be donated to the Historical Society.